Tomorrow morning, February 19, 2011, Maui’s music fans will converge in Kihei for the annual Whale Days Festival. Every year, the best in Maui music is represented at this open-air, family friendly, free concert. As MauiZan prepares for this year’s festival — we’re especially looking forward to Pat Simmons of the Doobie Brothers with Gail Swanson — we take a look back at last year’s event. Anuhea was scheduled to play along with many other great musicians including John Cruz — a MauiZan fave. The Tuesday before the festival, we saw a guy singing and playing guitar at Moana Cafe‘s open mic night. His talent was above and beyond most we had seen trip through the Paia café. So I put it in the back of my head to find out who this Wolf was; I thought he was great and in light of Chris’s comments, I knew there was something special about this guy. The following Saturday, we woke up early, rushed down Olinda Road and headed to Kihei to try to catch Anuhea at Whale Days. The Makawao-native was just breaking big and I had never seen her perform. We were running late and knew we had missed her starting time. We zipped down a side-street, found a place to park — like magic — and hit the pavement toward the beach park. As we approach the grandstand, we see a young woman on stage. “Is that her?” I ask. Hearing a familiar tune, you hear four voices say, “Yeah, it is,” as we work our way to the front of the stage. We find an open spot stage left, plop down our bags — and kids — whip out the cameras and get in position to shoot some photos. Enjoying the music but not yet looking up, I take my first glance at the stage. Whoa, the guy playing bass with Anuhea is Wolf, the guitarist who sang at Moana Tuesday night. “Is that the guy we saw the other night,” I asked my 9-year-old daughter. “Yeah, it is,” she responds. Thankfully, her eyes are better than mine. Anuhea, Wolf and the band played a selection of songs from her début album — and they sounded great. We were so thankful we had made it to the festival in time to catch the show. Whale Day rocks with Anuhea and Wolf. We were able to watch John Cruz, which was great as always, but had to leave the festival a little early; we had tickets to Ozomatli at the Maui Arts & Cultural Center’s Castle Theater. We head to Kahului, not having time to return to Olinda, and converge on the MACC. We indulge in some coffee — kind of necessary, it was a long day — just before the “5 minutes to show” announcement. Cutting it to the wire, we enter the theater just as the opening act takes the stage. Erin Smith of the Throwdowns was expected to play solo. We find our seats, take a nice breath, look at the stage and what do we see? Wolf! He was accompanying Smith during her opening set. One week earlier, I had never seen this guy perform. Now, three times within five days, there he was, on-stage with some of the most popular female artists on the island. 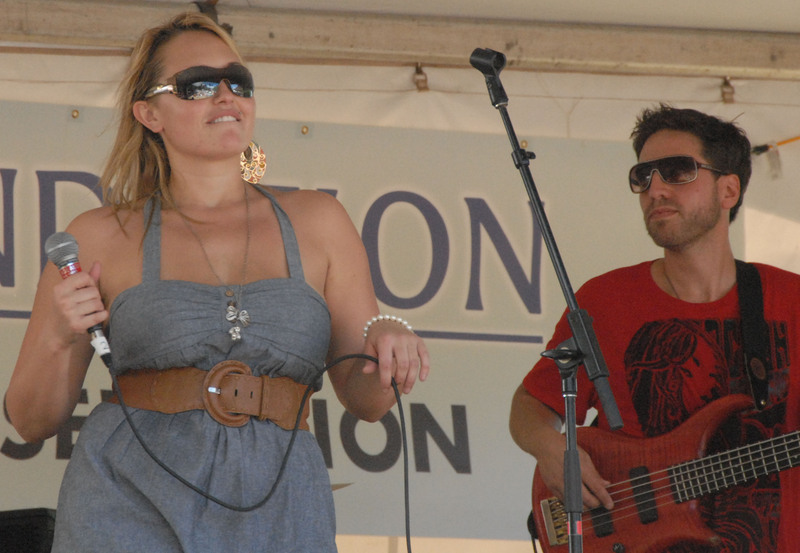 We’re not certain if Wolf will be with Anuhea on stage at Whale Days 2011. It would be nice, but he has so many gigs these days, we’ll forgive his absence — if we must. Love you Pacific Whale Foundation and all the artists who support this great event.